Play it easily on piano or synthtizer. 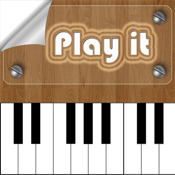 Learn how to play sweet songs on piano or keyboards with intuitive interface. Kids will be trained to listen and see musical notes on the keyboard after that they have three tries to play it. Very suitable for kids up to 10 years or for beginner at any age. Il s'agit d'apprendre comment jouer les grands classique sur clavier musical ou piano.